Starting today, you can encrypt the Lightweight Directory Access Protocol (LDAP) communications between your applications and AWS Directory Service for Microsoft Active Directory, also known as AWS Microsoft AD. Many Windows and Linux applications use Active Directory’s (AD) LDAP service to read and write sensitive information about users and devices, including personally identifiable information (PII). Now, you can encrypt your AWS Microsoft AD LDAP communications end to end to protect this information by using LDAP Over Secure Sockets Layer (SSL)/Transport Layer Security (TLS), also called LDAPS. This helps you protect PII and other sensitive information exchanged with AWS Microsoft AD over untrusted networks. To enable LDAPS, you need to add a Microsoft enterprise Certification Authority (CA) server to your AWS Microsoft AD domain and configure certificate templates for your domain controllers. After you have enabled LDAPS, AWS Microsoft AD encrypts communications with LDAPS-enabled Windows applications, Linux computers that use Secure Shell (SSH) authentication, and applications such as Jira and Jenkins. 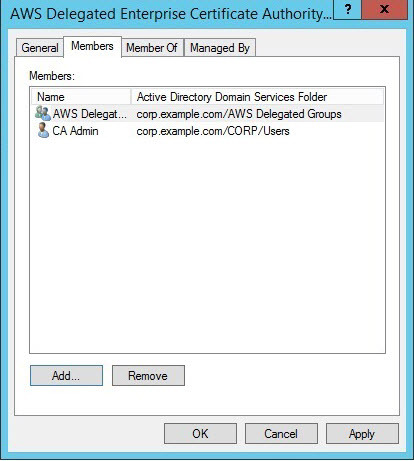 In this blog post, I show how to enable LDAPS for your AWS Microsoft AD directory in six steps: 1) Delegate permissions to CA administrators, 2) Add a Microsoft enterprise CA to your AWS Microsoft AD directory, 3) Create a certificate template, 4) Configure AWS security group rules, 5) AWS Microsoft AD enables LDAPS, and 6) Test LDAPS access using the LDP tool. Creating an Amazon EC2 for Windows Server instance and seamlessly joining it to your AWS Microsoft AD domain. Logging in to an Amazon EC2 for Windows Server instance using Remote Desktop Protocol (RDP). Launching and using Microsoft Windows Server Manager. Launching Windows PowerShell with administrative privileges and running Windows PowerShell scripts. Before going into specific deployment steps, I will provide a high-level overview of deploying LDAPS. I cover how you enable LDAPS on AWS Microsoft AD. In addition, I provide some general background about CA deployment models and explain how to apply these models when deploying Microsoft CA to enable LDAPS on AWS Microsoft AD. LDAP-aware applications (LDAP clients) typically access LDAP servers using Transmission Control Protocol (TCP) on port 389. By default, LDAP communications on port 389 are unencrypted. However, many LDAP clients use one of two standards to encrypt LDAP communications: LDAP over SSL on port 636, and LDAP with StartTLS on port 389. If an LDAP client uses port 636, the LDAP server encrypts all traffic unconditionally with SSL. If an LDAP client issues a StartTLS command when setting up the LDAP session on port 389, the LDAP server encrypts all traffic to that client with TLS. AWS Microsoft AD now supports both encryption standards when you enable LDAPS on your AWS Microsoft AD domain controllers. You enable LDAPS on your AWS Microsoft AD domain controllers by installing a digital certificate that a CA issued. 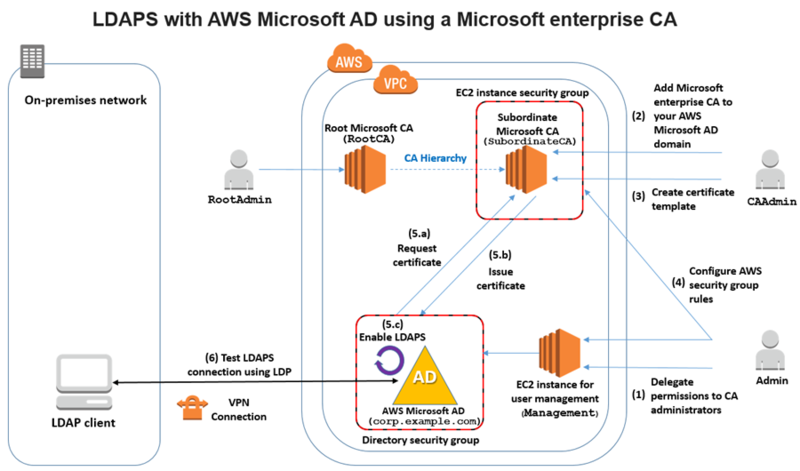 Though Windows servers have different methods for installing certificates, LDAPS with AWS Microsoft AD requires you to add a Microsoft CA to your AWS Microsoft AD domain and deploy the certificate through autoenrollment from the Microsoft CA. The installed certificate enables the LDAP service running on domain controllers to listen for and negotiate LDAP encryption on port 636 (LDAP over SSL) and port 389 (LDAP with StartTLS). You can deploy CAs as part of a single-level or multi-level CA hierarchy. In a single-level hierarchy, all certificates come from the root of the hierarchy. In a multi-level hierarchy, you organize a collection of CAs in a hierarchy and the certificates sent to computers and users come from subordinate CAs in the hierarchy (not the root). Certificates issued by a CA identify the hierarchy to which the CA belongs. When a computer sends its certificate to another computer for verification, the receiving computer must have the public certificate from the CAs in the same hierarchy as the sender. If the CA that issued the certificate is part of a single-level hierarchy, the receiver must obtain the public certificate of the CA that issued the certificate. If the CA that issued the certificate is part of a multi-level hierarchy, the receiver can obtain a public certificate for all the CAs that are in the same hierarchy as the CA that issued the certificate. If the receiver can verify that the certificate came from a CA that is in the hierarchy of the receiver’s “trusted” public CA certificates, the receiver trusts the sender. Otherwise, the receiver rejects the sender. Microsoft offers a standalone CA and an enterprise CA. Though you can configure either as single-level or multi-level hierarchies, only the enterprise CA integrates with AD and offers autoenrollment for certificate deployment. Because you cannot sign in to run commands on your AWS Microsoft AD domain controllers, an automatic certificate enrollment model is required. Therefore, AWS Microsoft AD requires the certificate to come from a Microsoft enterprise CA that you configure to work in your AD domain. When you install the Microsoft enterprise CA, you can configure it to be part of a single-level hierarchy or a multi-level hierarchy. 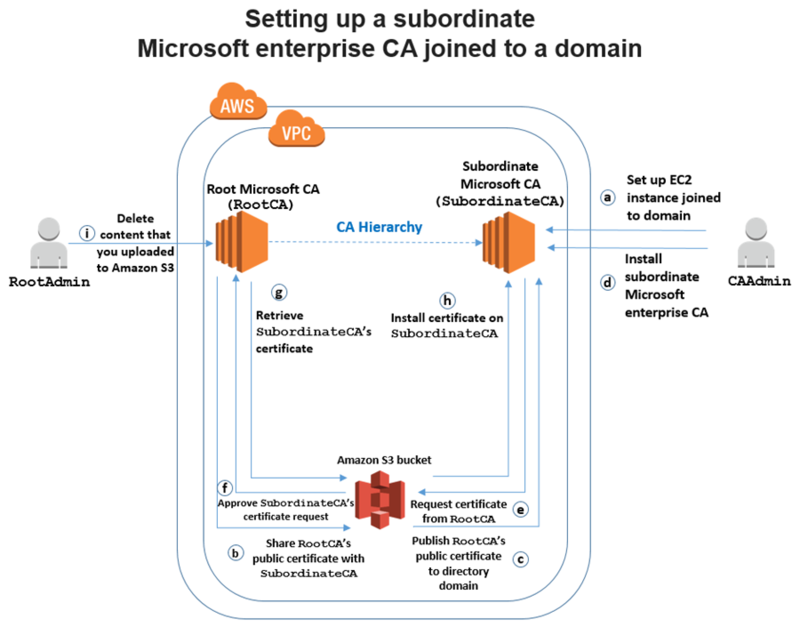 As a best practice, AWS recommends a multi-level Microsoft CA trust hierarchy consisting of a root CA and a subordinate CA. I cover only a multi-level hierarchy in this post. In a multi-level hierarchy, you configure your subordinate CA by importing a certificate from the root CA. You must issue a certificate from the root CA such that the certificate gives your subordinate CA the right to issue certificates on behalf of the root. This makes your subordinate CA part of the root CA hierarchy. You also deploy the root CA’s public certificate on all of your computers, which tells all your computers to trust certificates that your root CA issues and to trust certificates from any authorized subordinate CA. In such a hierarchy, you typically leave your root CA offline (inaccessible to other computers in the network) to protect the root of your hierarchy. You leave the subordinate CA online so that it can issue certificates on behalf of the root CA. This multi-level hierarchy increases security because if someone compromises your subordinate CA, you can revoke all certificates it issued and set up a new subordinate CA from your offline root CA. To learn more about setting up a secure CA hierarchy, see Securing PKI: Planning a CA Hierarchy. When a Microsoft CA is part of your AD domain, you can configure certificate templates that you publish. These templates become visible to client computers through AD. If a client’s profile matches a template, the client requests a certificate from the Microsoft CA that matches the template. Microsoft calls this process autoenrollment, and it simplifies certificate deployment. To enable LDAPS on your AWS Microsoft AD domain controllers, you create a certificate template in the Microsoft CA that generates SSL and TLS-compatible certificates. 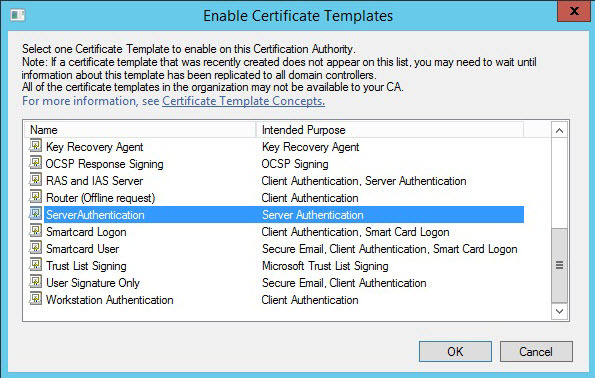 The domain controllers see the template and automatically import a certificate of that type from the Microsoft CA. The imported certificate enables LDAP encryption. The rest of this post is composed of the steps for enabling LDAPS for your AWS Microsoft AD directory. First, though, I explain which components you must have running to deploy this solution successfully. I also explain how this solution works and include an architecture diagram. An active AWS Microsoft AD directory – To create a directory, follow the steps in Create an AWS Microsoft AD directory. 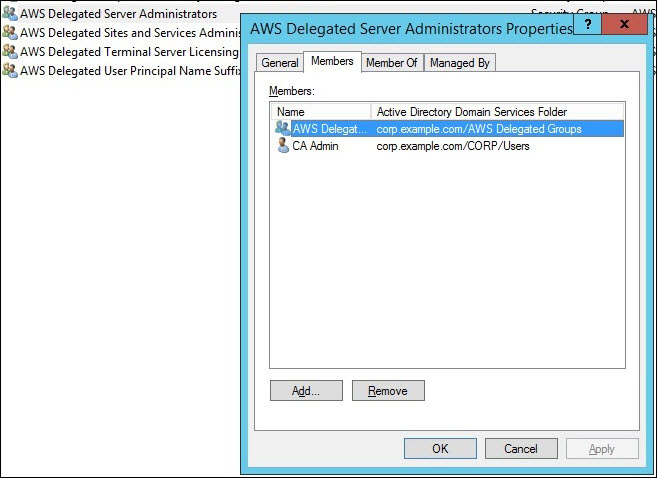 An Amazon EC2 for Windows Server instance for managing users and groups in your directory – This instance needs to be joined to your AWS Microsoft AD domain and have Active Directory Administration Tools installed. Active Directory Administration Tools installs Active Directory Administrative Center and the LDP tool. An existing root Microsoft CA or a multi-level Microsoft CA hierarchy – You might already have a root CA or a multi-level CA hierarchy in your on-premises network. If you plan to use your on-premises CA hierarchy, you must have administrative permissions to issue certificates to subordinate CAs. If you do not have an existing Microsoft CA hierarchy, you can set up a new standalone Microsoft root CA by creating an Amazon EC2 for Windows Server instance and installing a standalone root certification authority. You also must create a local user account on this instance and add this user to the local administrator group so that the user has permissions to issue a certificate to a subordinate CA. The following diagram illustrates the setup with the steps you need to follow to enable LDAPS for AWS Microsoft AD. You will learn how to set up a subordinate Microsoft enterprise CA (in this case, SubordinateCA) and join it to your AWS Microsoft AD domain (in this case, corp.example.com). You also will learn how to create a certificate template on SubordinateCA and configure AWS security group rules to enable LDAPS for your directory. As a prerequisite, I already created a standalone Microsoft root CA (in this case RootCA) for creating SubordinateCA. RootCA also has a local user account called RootAdmin that has administrative permissions to issue certificates to SubordinateCA. Note that you may already have a root CA or a multi-level CA hierarchy in your on-premises network that you can use for creating SubordinateCA instead of creating a new root CA. If you choose to use your existing on-premises CA hierarchy, you must have administrative permissions on your on-premises CA to issue a certificate to SubordinateCA. Lastly, I also already created an Amazon EC2 instance (in this case, Management) that I use to manage users, configure AWS security groups, and test the LDAPS connection. I join this instance to the AWS Microsoft AD directory domain. Delegate permissions to CA administrators (in this case, CAAdmin) so that they can join a Microsoft enterprise CA to your AWS Microsoft AD domain and configure it as a subordinate CA. Add a Microsoft enterprise CA to your AWS Microsoft AD domain (in this case, SubordinateCA) so that it can issue certificates to your directory domain controllers to enable LDAPS. This step includes joining SubordinateCA to your directory domain, installing the Microsoft enterprise CA, and obtaining a certificate from RootCA that grants SubordinateCA permissions to issue certificates. Create a certificate template (in this case, ServerAuthentication) with server authentication and autoenrollment enabled so that your AWS Microsoft AD directory domain controllers can obtain certificates through autoenrollment to enable LDAPS. 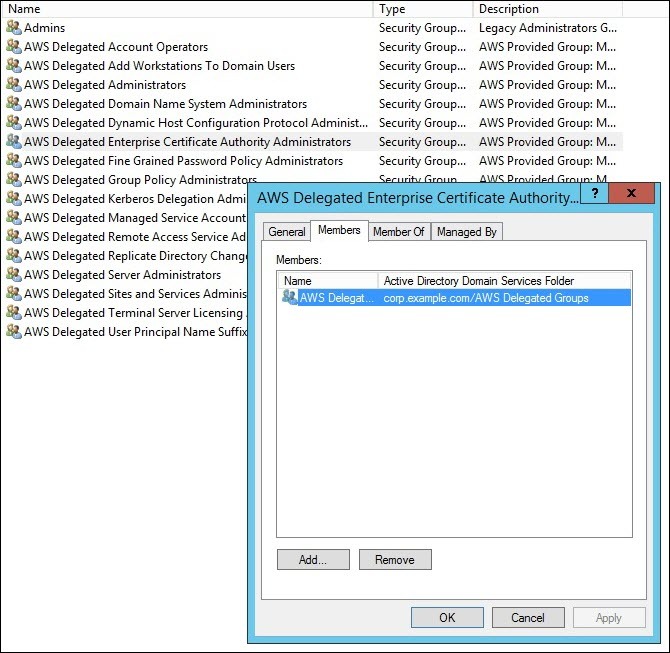 Configure AWS security group rules so that AWS Microsoft AD directory domain controllers can connect to the subordinate CA to request certificates. AWS Microsoft AD domain controllers request a certificate from SubordinateCA. SubordinateCA issues a certificate to AWS Microsoft AD domain controllers. AWS Microsoft AD enables LDAPS for the directory by installing certificates on the directory domain controllers. Test LDAPS access by using the LDP tool. I now will show you these steps in detail. I use the names of components—such as RootCA, SubordinateCA, and Management—and refer to users—such as Admin, RootAdmin, and CAAdmin—to illustrate who performs these steps. All component names and user names in this post are used for illustrative purposes only. In this step, you delegate permissions to your users who manage your CAs. Your users then can join a subordinate CA to your AWS Microsoft AD domain and create the certificate template in your CA. To enable use with a Microsoft enterprise CA, AWS added a new built-in AD security group called AWS Delegated Enterprise Certificate Authority Administrators that has delegated permissions to install and administer a Microsoft enterprise CA. By default, your directory Admin is part of the new group and can add other users or groups in your AWS Microsoft AD directory to this security group. If you have trust with your on-premises AD directory, you can also delegate CA administrative permissions to your on-premises users by adding on-premises AD users or global groups to this new AD security group. 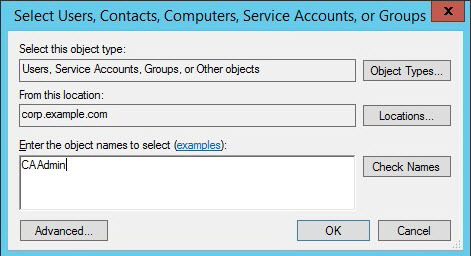 Sign in to the Management instance using RDP with the user name admin and the password that you set for the admin user when you created your directory. Launch the Microsoft Windows Server Manager on the Management instance and navigate to Tools > Active Directory Users and Computers. Switch to the tree view and navigate to corp.example.com > CORP > Users. Right-click Users and choose New > User. Add a new user with the First name CA, Last name Admin, and User logon name CAAdmin. 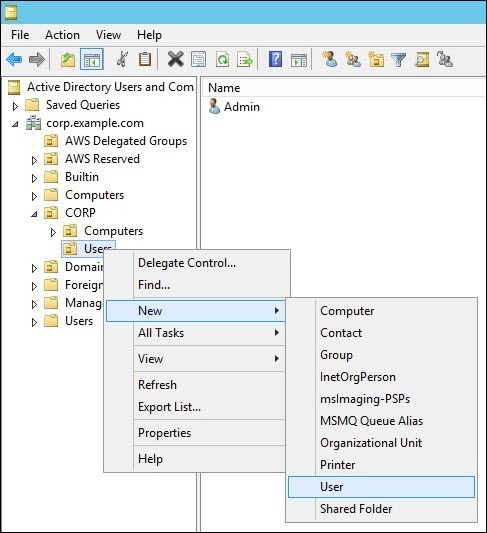 In the Active Directory Users and Computers tool, navigate to corp.example.com > AWS Delegated Groups. In the right pane, right-click AWS Delegated Enterprise Certificate Authority Administrators and choose Properties. In the AWS Delegated Enterprise Certificate Authority Administrators window, switch to the Members tab and choose Add. In the Enter the object names to select box, type CAAdmin and choose OK. In the next window, choose OK to add CAAdmin to the AWS Delegated Enterprise Certificate Authority Administrators security group. Also add CAAdmin to the AWS Delegated Server Administrators security group so that CAAdmin can RDP in to the Microsoft enterprise CA machine. You have granted CAAdmin permissions to join a Microsoft enterprise CA to your AWS Microsoft AD directory domain. In this step, you set up a subordinate Microsoft enterprise CA and join it to your AWS Microsoft AD directory domain. I will summarize the process first and then walk through the steps. First, you create an Amazon EC2 for Windows Server instance called SubordinateCA and join it to the domain, corp.example.com. You then publish RootCA’s public certificate and certificate revocation list (CRL) to SubordinateCA’s local trusted store. You also publish RootCA’s public certificate to your directory domain. Doing so enables SubordinateCA and your directory domain controllers to trust RootCA. You then install the Microsoft enterprise CA service on SubordinateCA and request a certificate from RootCA to make SubordinateCA a subordinate Microsoft CA. 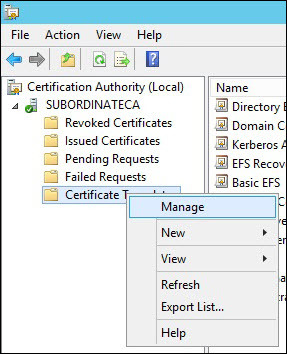 After RootCA issues the certificate, SubordinateCA is ready to issue certificates to your directory domain controllers. 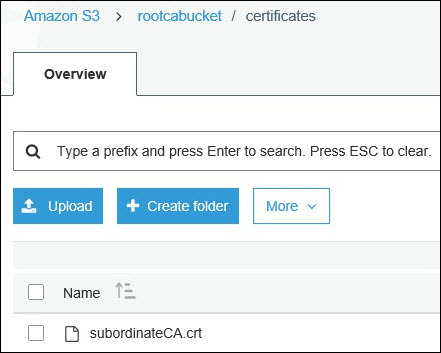 Note that you can use an Amazon S3 bucket to pass the certificates between RootCA and SubordinateCA. Set up an Amazon EC2 instance joined to your AWS Microsoft AD directory domain – Create an Amazon EC2 for Windows Server instance to use as a subordinate CA, and join it to your AWS Microsoft AD directory domain. For this example, the machine name is SubordinateCA and the domain is corp.example.com. Share RootCA’s public certificate with SubordinateCA – Log in to RootCA as RootAdmin and start Windows PowerShell with administrative privileges. Run the following commands to copy RootCA’s public certificate and CRL to the folder c:\rootcerts on RootCA. 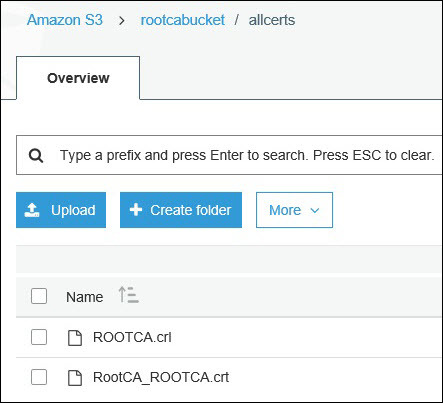 Upload RootCA’s public certificate and CRL from c:\rootcerts to an S3 bucket by following the steps in How Do I Upload Files and Folders to an S3 Bucket. The following screenshot shows RootCA’s public certificate and CRL uploaded to an S3 bucket. Publish RootCA’s public certificate to your directory domain – Log in to SubordinateCA as the CAAdmin. Download RootCA’s public certificate and CRL from the S3 bucket by following the instructions in How Do I Download an Object from an S3 Bucket? Save the certificate and CRL to the C:\rootcerts folder on SubordinateCA. Add RootCA’s public certificate and the CRL to the local store of SubordinateCA and publish RootCA’s public certificate to your directory domain by running the following commands using Windows PowerShell with administrative privileges. Install the subordinate Microsoft enterprise CA – Install the subordinate Microsoft enterprise CA on SubordinateCA by following the instructions in Install a Subordinate Certification Authority. Ensure that you choose Enterprise CA for Setup Type to install an enterprise CA. For the CA Type, choose Subordinate CA. Request a certificate from RootCA – Next, copy the certificate request on SubordinateCA to a folder called c:\CARequest by running the following commands using Windows PowerShell with administrative privileges. Upload the certificate request to the S3 bucket. 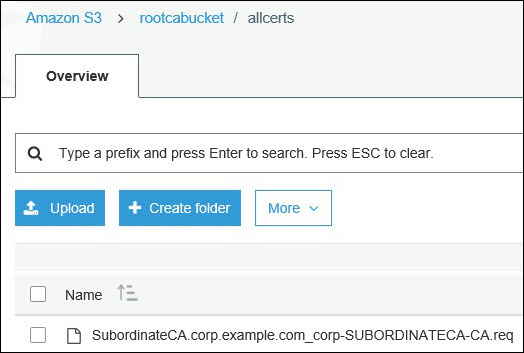 Approve SubordinateCA’s certificate request – Log in to RootCA as RootAdmin and download the certificate request from the S3 bucket to a folder called CARequest. Submit the request by running the following command using Windows PowerShell with administrative privileges. 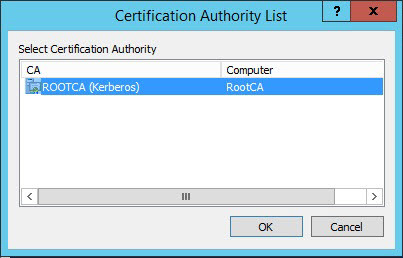 In the Certification Authority List window, choose OK.
Navigate to Server Manager > Tools > Certification Authority on RootCA. 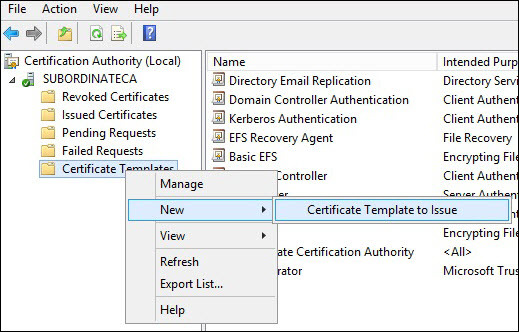 In the Certification Authority window, expand the ROOTCA tree in the left pane and choose Pending Requests. In the right pane, note the value in the Request ID column. Right-click the request and choose All Tasks > Issue. Retrieve the SubordinateCA certificate – Retrieve the SubordinateCA certificate by running following command using Windows PowerShell with administrative privileges. The command includes the <RequestId> that you noted in the previous step. Upload SubordinateCA.crt to the S3 bucket. Install the SubordinateCA certificate – Log in to SubordinateCA as the CAAdmin and download SubordinateCA.crt from the S3 bucket. Install the certificate by running following commands using Windows PowerShell with administrative privileges. Delete the content that you uploaded to S3 – As a security best practice, delete all the certificates and CRLs that you uploaded to the S3 bucket in the previous steps because you already have installed them on SubordinateCA. You have finished setting up the subordinate Microsoft enterprise CA that is joined to your AWS Microsoft AD directory domain. 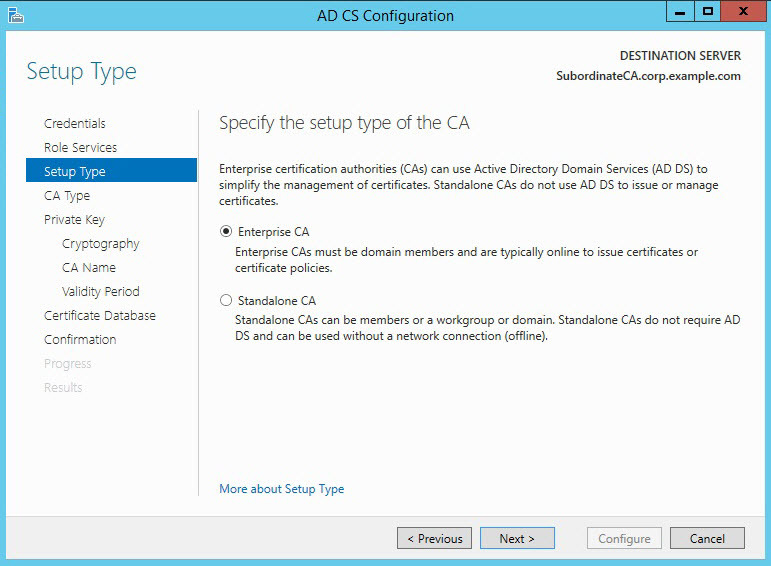 Now you can use your subordinate Microsoft enterprise CA to create a certificate template so that your directory domain controllers can request a certificate to enable LDAPS for your directory. 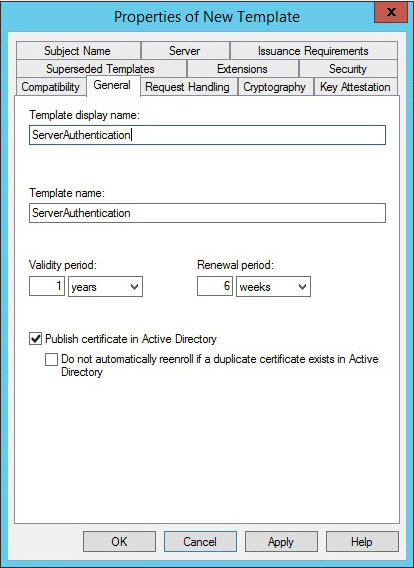 In this step, you create a certificate template with server authentication and autoenrollment enabled on SubordinateCA. 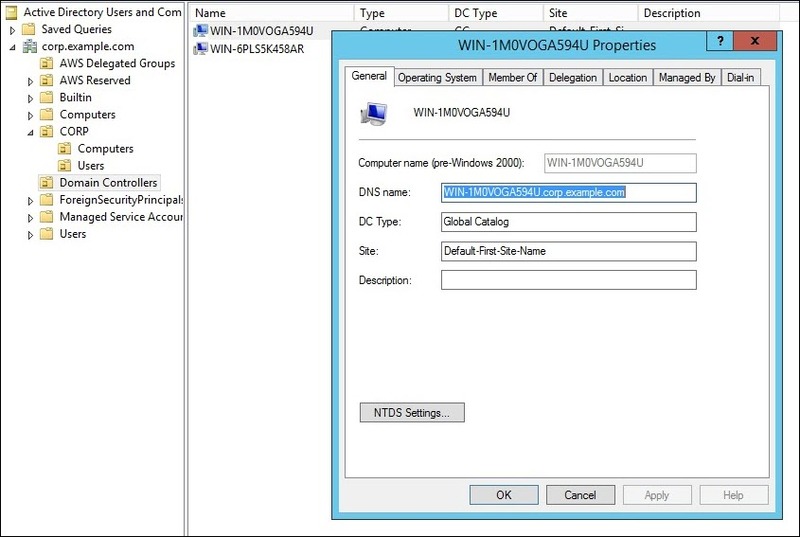 You create this new template (in this case, ServerAuthentication) by duplicating an existing certificate template (in this case, Domain Controller template) and adding server authentication and autoenrollment to the template. Log in to SubordinateCA as CAAdmin. Launch Microsoft Windows Server Manager. Select Tools > Certification Authority. In the Certificate Authority window, expand the SubordinateCA tree in the left pane. Right-click Certificate Templates, and choose Manage. 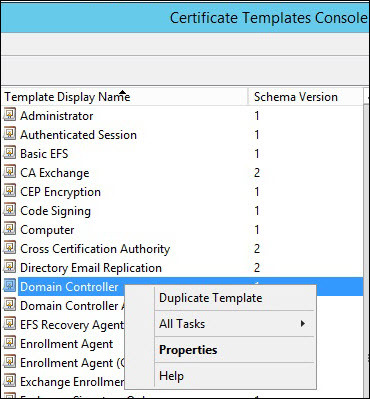 In the Certificate Templates Console window, right-click Domain Controller and choose Duplicate Template. In the Properties of New Template window, switch to the General tab and change the Template display name to ServerAuthentication. Switch to the Security tab, and choose Domain Controllers in the Group or user names section. 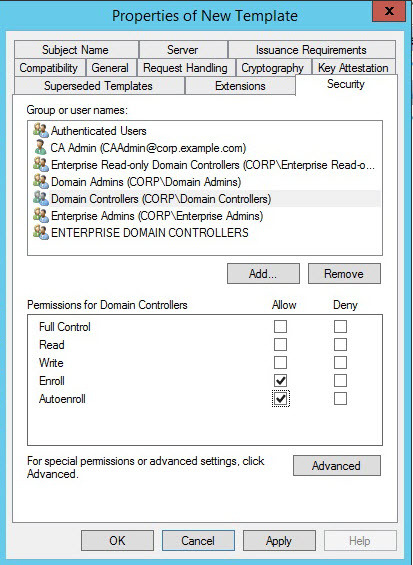 Select the Allow check box for Autoenroll in the Permissions for Domain Controllers section. 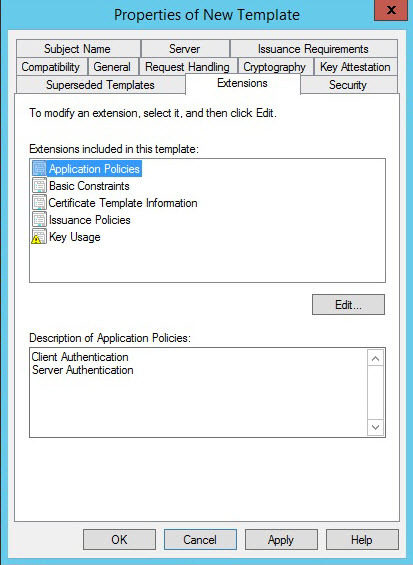 In the Edit Application Policies Extension window, choose Client Authentication and choose Remove. Choose OK to create the ServerAuthentication certificate template. Close the Certificate Templates Console window. In the Certificate Authority window, right-click Certificate Templates, and choose New > Certificate Template to Issue. 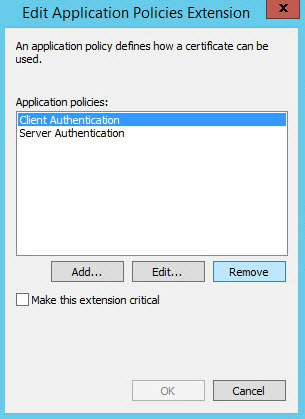 In the Enable Certificate Templates window, choose ServerAuthentication and choose OK.
You have finished creating a certificate template with server authentication and autoenrollment enabled on SubordinateCA. Your AWS Microsoft AD directory domain controllers can now obtain a certificate through autoenrollment to enable LDAPS. In this step, you configure AWS security group rules so that your directory domain controllers can connect to the subordinate CA to request a certificate. To do this, you must add outbound rules to your directory’s AWS security group (in this case, sg-4ba7682d) to allow all outbound traffic to SubordinateCA’s AWS security group (in this case, sg-6fbe7109) so that your directory domain controllers can connect to SubordinateCA for requesting a certificate. You also must add inbound rules to SubordinateCA’s AWS security group to allow all incoming traffic from your directory’s AWS security group so that the subordinate CA can accept incoming traffic from your directory domain controllers. Log in to the Management instance as Admin. In the left pane, choose Network & Security > Security Groups. In the right pane, choose the AWS security group (in this case, sg-6fbe7109) of SubordinateCA. Switch to the Inbound tab and choose Edit. Choose Add Rule. Choose All traffic for Type and Custom for Source. Enter your directory’s AWS security group (in this case, sg-4ba7682d) in the Source box. Choose Save. Now choose the AWS security group (in this case, sg-4ba7682d) of your AWS Microsoft AD directory, switch to the Outbound tab, and choose Edit. Choose Add Rule. Choose All traffic for Type and Custom for Destination. Enter your directory’s AWS security group (in this case, sg-6fbe7109) in the Destination box. Choose Save. You have completed the configuration of AWS security group rules to allow traffic between your directory domain controllers and SubordinateCA. The AWS Microsoft AD domain controllers perform this step automatically by recognizing the published template and requesting a certificate from the subordinate Microsoft enterprise CA. 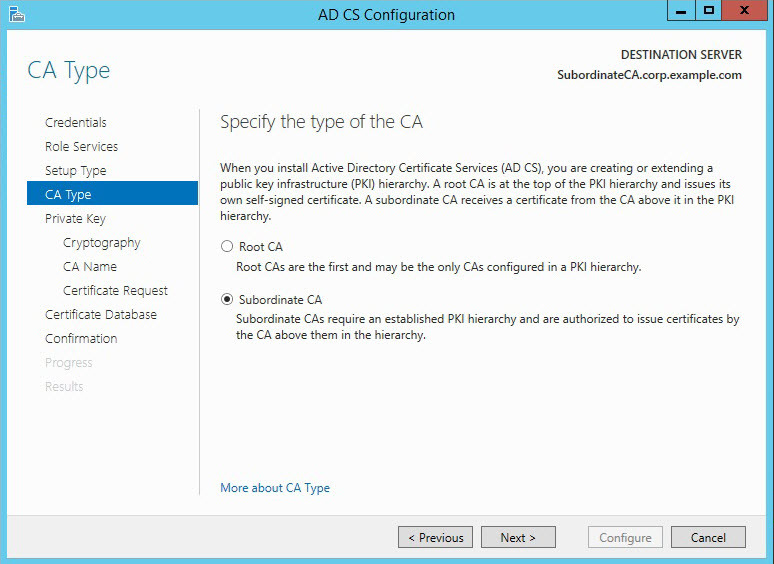 The subordinate CA can take up to 180 minutes to issue certificates to the directory domain controllers. The directory imports these certificates into the directory domain controllers and enables LDAPS for your directory automatically. This completes the setup of LDAPS for the AWS Microsoft AD directory. The LDAP service on the directory is now ready to accept LDAPS connections! In this step, you test the LDAPS connection to the AWS Microsoft AD directory by using the LDP tool. The LDP tool is available on the Management machine where you installed Active Directory Administration Tools. Before you test the LDAPS connection, you must wait up to 180 minutes for the subordinate CA to issue a certificate to your directory domain controllers. Log in to Management as Admin. Launch the Microsoft Windows Server Manager on Management and navigate to Tools > Active Directory Users and Computers. 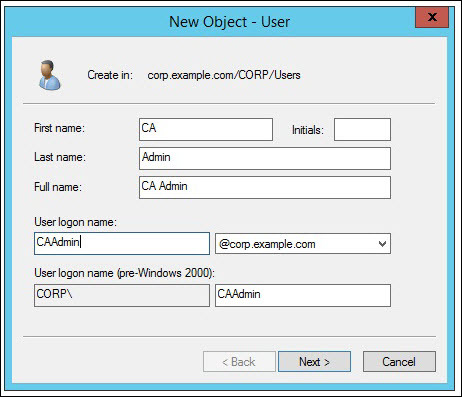 Switch to the tree view and navigate to corp.example.com > CORP > Domain Controllers. In the right pane, right-click on one of the domain controllers and choose Properties. Copy the DNS name of the domain controller. Launch the LDP.exe tool by launching Windows PowerShell and running the LDP.exe command. In the LDP tool, choose Connection > Connect. In the Server box, paste the DNS name you copied in the previous step. Type 636 in the Port box. Choose OK to test the LDAPS connection to port 636 of your directory. You should see the following message to confirm that your LDAPS connection is now open. You have completed the setup of LDAPS for your AWS Microsoft AD directory! You can now encrypt LDAP communications between your Windows and Linux applications and your AWS Microsoft AD directory using LDAPS. In this blog post, I walked through the process of enabling LDAPS for your AWS Microsoft AD directory. Enabling LDAPS helps you protect PII and other sensitive information exchanged over untrusted networks between your Windows and Linux applications and your AWS Microsoft AD. To learn more about how to use AWS Microsoft AD, see the Directory Service documentation. For general information and pricing, see the Directory Service home page. If you have comments about this blog post, submit a comment in the “Comments” section below. If you have implementation or troubleshooting questions, start a new thread on the Directory Service forum or contact AWS Support.